Al-Udeid Military Air Base in Qatar, Presidential Inaugural Ball, The Isley Brothers, The B-52's, Toots Hibbert, Cuba Gooding Sr.
Nick received his B.S. in Music Education from Towson University. He is on the music faculty at Loyola College, McDaniel College, & McDonogh School. Nick gives instruction in classical and jazz styles to students of all musical abilities from elementary to the collegiate level. Many current students are 1st chair in their respective school bands and participate in All-County and All-State Concert and Jazz Bands. Nick has been Performing and Teaching in the Baltimore/D.C. area for the past 15 years. He is a featured soloist in the Westminster Symphony Orchestra & Carroll County Jazz Ensemble. Performing highlights include performing with The Isley Brothers, The B-52's, Toots Hibbert, Cuba Gooding Sr. In 2010 Nick performed for U.S troops stationed at Al-Udeid Military Air Base in Qatar. In 2009 he performed at the Presidential Inaugural Ball. 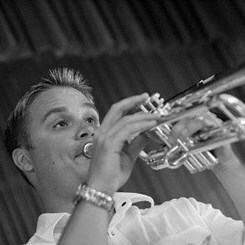 Nick also composes & performs for several local bands in addition to leading his own jazz group and classical brass quintet. Nick also does studio recordings for jazz, rock, pop, commercial reggae/ska, gospel, funk bands, including Billboard’s #1 Album For Contemporary Jazz, Sep 2007 - "Najee - Rising Sun". Nick has been teaching at the Music & Arts Laurel store since 2000. In 2011 he was featured in the music & arts newsletter "Sound Teaching". Also in 2011 his student won a nationwide competition to be featured on the Music & Arts promotional posters for all the stores. Request Lessons with Nicholas today!